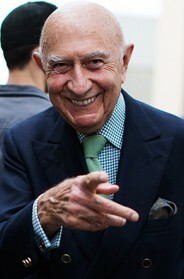 Mr Modenese is one of my favorite guys to shoot in Milan – I can always count on him to look sharp at the shows. 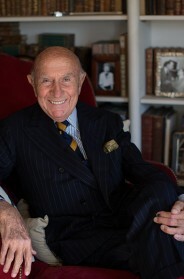 i’m just a fashion outsider: but who is Beppe Modenese? i really like that the collar of his jacket points the same way as his ears! Nice peaked lapel double breated suit. I must say that isn’t a very easy style to wear but he looks very comfortable in it. The tie clip and the matching pocket square. Molto chic and very nonchalant. Looks like he dresses this way everyday. What does he do? Double-breasted suits rule–and the lapels on this one are positively heroic. But the extra-low waist-button here is causing a bit of havoc with the relatively short tie. Ultimately, the problem is, how best to fit a guy with a large, protuberant trunk. Older man class all the way. But he doesn’t – what’s with the saggy lapels on that gorgeous jacket?! button stance way too low for my taste. elegant man, beautiful photograph. a breath of fresh air. The matching ears and lapels are great. Well spotted, marianne. 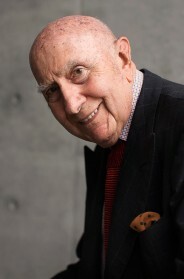 Beppe Modenese is the man who actually started fashion week years ago. He’s an ambassador and visionary for the fashion industry, and one of the best dressed men in the world…almost every day. He reminds me of my Grandfather…Lolo Marcelo. He looks amazingly classly and vision for all men to aspire to once they reach thier older years. nice job getting the exposure right, that lighting is killer. it kind of makes the right shoulder of his suit look ill-fitting but i’m going to assume that it’s the light and not his suit. 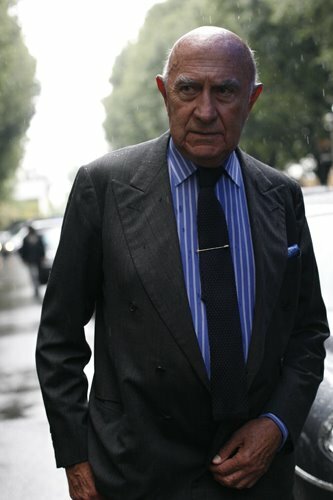 Beppe is always very elegant he is the milanese guru of fashion (and an eccellent fashion businessman) and he is in Milan and in the fashion world what Gianni Agnelli was in Turin and in the car industry world.He is one of a kind. It’s not just what he wear’s but how he exudes history through his eyes! So I keep staring at this photo, perhaps in the perverse hope that I’d find some kind of a terminal flaw. But it remains as striking as on the first day. Words like stamina, insight, awe, integrity come to mind, someone who knows. agreed concupiscence, the depth of field is perfect, and the over exposure over the shoulder just adds to the emphemeral feel..
Is he wearing a safety pin on his tie too, like Beppe? He certainly looks sharp, but the wrinkled lapels disturb me a bit.